Two blind people talk about how they have responded to significant difficulties in their lives and why they are feeling positive about the future. At the age of 14, Israel Martin’s life was on the verge of going off the rails. Growing up in Newham in East London, Israel was a member of a gang which committed crime and got involved in fights. When he started to lose his sight, his life changed, but not as he would have originally expected it to. Our reporter, Tom Walker, has been speaking to Israel at the Royal National College for the Blind in Hereford. Also, Peter White meets visually impaired dancer, Janet Salt from South Manchester. Janet led a very busy life until she started to experience depression. 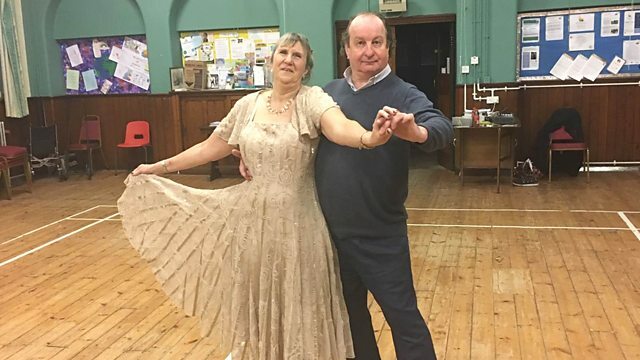 Janet tells Peter about how, with the help of ballroom dancing, she regained her confidence. Good evening. Tonight, two contrasting stories of turning your life around. The man who believes his blindness has saved him from a life of gangs and knives. And the woman who’s danced her way from depression back to a satisfying social life. But before all that, a reaction to our recent programme about life as a visually impaired student in 2018. Marsha Corper [phon.] emailed us to contrast her experience with theirs. I really found the students on the programme this evening fascinating. I was the first blind student at the University of East Anglia in 1966. I had a £50 grant for three years from the Clothworkers’ Guild and that was it. I was a white cane user and was in university accommodation a few miles away from the actual site of learning. We caught a bus each morning. Other students leapt on to it with their toast etc. in their hands. I struggled with a Perkins Brailer in one hand and books under the other arm. Difficult to use a white cane and find a seat. I had a very young tutor who helped me organise readers. He would choose the essential books for me to read and highlight the main chapters. He then organised book tokens for those readers at the end of terms. Having been to an all-girls school for blind girls I found the whole experience extremely testing. In the second year – yes, I survived somehow – I met an incredible student who teased me mercilessly. She organised about 14 male readers for me and gradually I loosened up and my work began to improve. Taking finals was quite another experience but fascinating. What students are having to go through now sounds much more complicated, time consuming and stressful. It certainly makes me glad that I went to university when it was financially possible for me to do so and when I didn’t have to worry about all the high-tech stuff. Is it really better now? Now, if you’d told Israel Martin, a few years ago, that he’d end up as a student, he’d probably have laughed in your face. At the age of 14 Israel’s life was very close to going off the rails, indeed some residents of Newham in East London would say it already had. Israel was a member of a gang and by his own admission he was regularly involved in crimes, such as robbery and fighting. But then he started to lose his sight. Eight years later his life has totally changed and not in ways that he was expecting. Our reporter, Tom Walker, has been to meet Israel at the Royal National College for the Blind in Hereford, which offers a range of academic and vocational courses. This is my room on the second floor in Stephen’s Hall which I’m going to open now and we can get in. Around 11 and 12, that’s when I would start probably going down the hill. I used to – wanted to do things to impress people that – a crowd – I wanted to do stuff and funnily enough the stuff that they thought was funny all comes to criminal stuff, looking back on it now, you know, Israel go, take that from that person and run away or stuff like that. In my area the cool guys was the ones that was on the streets and stuff like that. I used to do stuff like, you know, I used to steal from shops, I used to get into fights and then I used to hang around with the wrong crowd. It could be looked at as a gang but for me, at that time, I saw it as a family – somewhere outside home I could feel warmth. I remember a certain time when I used to get like stabbed with like compasses, like there was one time a compass got stabbed in my leg and I was bleeding out, so I had to get rushed into hospital. But to someone that’s not from the area where I’m from probably sees it as a wake-up call. To me I saw that as bragging rights, you know, I went to school the next day showing my marks, like look what happened to me, you know. At the age of 13, 14 were you carrying a knife yourself? There was a time where you had to carry something. So, I wouldn’t say I was carrying a knife but I was carrying like it could be a compass or like a metal little pole, something like that, just so I felt safe. But not me knowing when you’re carrying that you’re putting yourself in danger. In my head I was the baddest, you know no one could touch me. When I got into fights even if I lost a fight and bloodied, in my head I won – I knocked him out, I knocked him senseless and he learned a lesson. I really enjoyed fighting. What about your friends? How many close friends did you have? When I was younger, I had many so-called friends. So, that’s where – you know it changed where I would say I thought they was close – family – but until when I got ill, now, this is where it started to change because why? ‘Cos I couldn’t do the stuff that I used to do no more because now I’m a liability, I have eyesight problems, so I wouldn’t be able to run the same, I wouldn’t see the person from afar. So, when I was in hospital I didn’t see most of the faces, who I did see was my family and my close, close friends who I’m still with today. Just tell me a little bit more about the fellow gang members that you once knew. What type of things did they do and are they still doing? Well, all criminal stuff, what you could imagine, down to thieving, threatening, harassing, drugs – it’s just most of the stuff you could think of. So, we’re just walking over to the hall of residence now. How have you found life in Hereford so far? Ah it’s much more – to be honest, at first, I thought that it was going to be hard getting used to coming here and stuff like that but I fitted in very well, like everyone here was nice to me, told me keep my head up, stuff like that. So, literally in a week I settled down and I’m actually comfortable here. Your eyesight started to go at the age of 14. Tell me about the condition and what effects it had on you straightaway. A doctor looked at me and said – you will never get your eyesight back and this is you, this is who you’ll be for the rest of your life. That really – it really set me back a couple of months because I was healing every month like mentally and to hear that it really set me back. I still remember walking out of the hospital and then my mum trying to hold her tears back and then she just let it out. For a while I was just at home in my room, just didn’t want no visitors. And at the same time, you’re feeling, I’m guessing, quite isolated? I was very isolated because even though I had a big family I never opened up to them, I never told them how down I really was. So, once you were ill and you were in bed and your sight had gone, did you ever see any of your fellow gang members again? I saw them on the street, not them coming to see me. At that time, I was a bit like – wow, I thought it was a family – but later on or years later I realised how dumb of me to think that. But then it was a bit of a reality check. Me, personally, losing my eyesight is a blessing. I say that because if I never went through what I went through I probably would have been either in jail, dead or probably on the road for both of them because looking back at me then I couldn’t see myself turning around unless I had something that what I went through in 2010 when I did get ill because now, if you know me now, you wouldn’t be able to imagine me then. It’s like if you knew me then and only then you wouldn’t know how to imagine me now. So, I see it as a second chance. I had a second chance. You can see it in a spiritual way or you can see it in a general way. I feel like God gave me a second chance for me to change my life and see what I was actually doing. So, I say even though my eyesight has gone or I lost more of my eyesight I see way more than I saw before. I will make a copy of the audio recording and email it to you, so that you can listen back to your presentation. This is about if there was a balloon and there’s someone – and there’s many people in the balloon and someone has to be left on and others get kicked out, you have to name one person that has a right – can I say has a right to stay on the balloon? …compared to the others. And I chose Jesus because that’s [indistinct word] the most. There are visually impaired criminals so perhaps you would have reformed as a fully sighted person? Everyone’s different same time, everyone’s different. If I was fully sighted now, I wouldn’t be here educating myself and to be honest I wouldn’t have took music seriously and I wouldn’t have known that I had other bubbly side where I can do stand-up because I didn’t really do those stuff before, I was always known as a funny guy before but not in a serious way. What I went through because it’s so easy for hierarchies to look and tell people how they should change but I feel like because I was there, hearing people tell me that to me it was so ignorant or just so – you don’t understand where I’m coming from. So, for me to change and see that I understand why people go through it every day. We’ve talked about your fellow gang members, what are many of them doing now, do you know? Most of them are either still doing drugs, prison or dead, to be honest, it’s very sad but that’s the honest truth. Israel Martin talking with Tom Walker. Janet Salt loves dancing. I’ve dropped in on her regular Sunday evening class in south Manchester, with ballroom teacher Paul Burton. And dancing has been only one of Janet’s enthusiasms over a crowded life. But she discovered a few years ago that confidence can desert you and sometimes for no apparent reason. She’s been telling me about the experience but first, how dancing has put her back on the road to a full life. …five, six, seven, eight, rock, rock, rock, tango, close. One, two, three, four, five six, step one, step two, step…. It’s an up and down motion, so you sideways on your right, you bring your left foot, touch it, you take the left foot away, then you step through and do the opposite foot. So, it’s like alternate touching one foot to the other, it’s very graceful. And I should explain, I mean we’re recording this but this is a kind of rehearsal for an event which is going to be going out on the day this programme is. Just explain what you’re going to be doing in Blackpool. Yes, this is what we’re going to be doing in the Blackpool Tower Ballroom. I’m so looking forward to that because of course it’s nearly Christmas, I’m sure it’ll all be beautifully decorated, it will be magical. This is not a competition is it? No, this is pure pleasure. Now anyone listening to you now and meeting you, you sound like a very confident person and yet what seems to have happened sounds like a loss of confidence. Just explain the circumstances. Well I’ve always done so much. I mean when I was in my teens and early twenties I used to break and train horses. After that we did up several houses and then I took up water skiing and I was world champion twice. I did two degrees and then I took up dancing. Just explain what changed and what affected your confidence. What happened was I ran out of things to do. I had no more challenges, no more goals, I thought what am I going to do with my day. I’d wake up in the morning, I’d think well there’s not much point getting up really because I’ve got nothing to do anyway, except housework, and who wants to jump out of bed to do that? It was much easier to lie on my bed and listen to a talking book and not do anything. But then you start to feel unwell and then you start to feel stiff because you’re not exercising and then you feel worse because you’re stiff and you’re not exercising, so then you feel depressed, so you don’t want to go and do any exercise. So, it’s a vicious circle. How much do you think the fact of your visual impairment had to do with that and I suppose we should also explain, you’ve got a hearing loss as well, so presumably going out on your own in this – there’s more effort involved isn’t there. There’s a lot more effort and there’s a lot more organising to do, you can’t just decide – oh I’m going to go somewhere today, I’m going to say – go to Stockport or Manchester – you’ve got to think about what you’re going to do when you get there, do you know where you want to go. You have to plan it, you have to find out where it is exactly. And I think the deafness is a real problem. Blindness is a nuisance but deafness is a real challenge because it affects everything. Most of the time people who can’t see they compensate with their hearing but if you’ve lost your hearing as well, then that really does compound the problem quite seriously. If you can’t communicate easily with people, first of all, you can’t hear if a person’s there and if you do ask them for help you may not be able to hear what they say, particularly in a noisy environment. Did you understand at the time that that was going on – did you understand what was happening to you, given how much you’d been doing before? I think it’s easy to slip into depression and once you get on that downward spiral you don’t care, you’re quite happy to do nothing. And it’s only, like I say, when it really began to affect my health that I thought come on, you’ve really got to do something about this. Grapevine to seven 11. Back ruck to promenade. Roll in and roll out. How did you break out of that mood, what did you do? It can’t be quite that simple. Well it wasn’t because I remember the first time I went to a U3A meeting, I stepped into the hallway and the noise level was horrendous. I thought I’m not going to be able to cope with this. I very nearly turned round and went home. But I did make myself go in and get through that first meeting. But after that initial breaking of the ice and I got to know people and I joined some of the groups, then it started to make a big difference, I suddenly had something to do practically every day. You’ve described really what it was like when you had lost this confidence and were really not sure that you could really bare to go out and meet people, just describe what your life is like now. Much better. In fact, I’ve got so much to do each day it was hard to fit things in, it was absolutely amazing, I can go from doing nothing to having virtually too much to do. At the moment we’re very much involved in practising the dancing for this very special event next Tuesday. To me, that is Christmas. So, dancing is very much associated with Christmas? Yeah, yeah, it is Christmas, without the dancing it wouldn’t really be Christmas for me. What would you say to someone, perhaps listening to this, who recognises that they’re perhaps in a similar place to you, what would you say or maybe has never had the confidence to get out on their own and do things? I think it would depend what age they were. If they were older people, I would recommend they join the U3A. If they’re younger people then I think they should decide – what is it I would like to do – that’s the starting point because we all like different things, we’ve all got different ambitions, we’ve got different levels. So, decide what you want to do and then find a way to do it. But you’ve got to make that initial step, you’ve got to say to yourself I want to get out of this rut, I want my life to be better and then go from there – push the doors open yourself. You took your leg up too quick Janet. [Laughter] Can we just do that again. Janet Salt enjoying life again for all to hear. And finally someone else who still seems to know the secret of enjoying herself as she enters her 90th year. Next Tuesday is Christmas Day of course but In Touch never rests and I’ll be visiting one of the great names of British theatre and film for the past six decades. She was married to Sir Laurence Olivier. Dame Joan Plowright has now lost most of her sight, it’s not dimmed her enthusiasm for life, as you’ll hear. No, I can’t see very well. I mean I can see the difference between light and dark, I can see the shape of somebody in front of me but no details of colour or what they’re wearing or their face. Right. So, what about your photographs for example? No, I can’t really see those to judge them. I have to depend on people to describe them to me and then I remember the incident and the place. Do you still do that though, do you get them out and get someone to riffle through them? Well I don’t do it unless I’ve got to do it for a purpose. I’m living in the present, in the now. And I think you always did, didn’t you, that’s always been your way of doing things. A full half hour on Christmas night at home with Joan Plowright. And that’s all for tonight. From me, Peter White, tonight’s producer, Tom Walker and the team, goodbye. Listen anytime or anywhere. Subscribe to this programme or download individual episodes.